We are now in the final days of rehearsal for Four Quartets, which premieres at the Fisher Center on July 6. The dancers have been joined by The Knights, a Brooklyn-based contemporary music ensemble who are playing Kaija Saariaho’s score, and by Kathleen Chalfant, the legendary stage actor, who is reading Eliot’s poems live in our performances. Kathy has been fully immersed in Four Quartets with us for a number of months, and recently undertook the same pilgrimage to the four sites that Pam and I made last year. She has created a strong partnership with the musicians and dancers in the production, and is doing extraordinary work integrating her reading of the poems with the choreographic and musical score. Last week Kathy and I recorded a radio interview for NPR in which she describes her experience of the project, and reads several sections of Four Quartets. I think you’ll immediately hear the great qualities she brings to Eliot’s poems. Kathleen Chalfant in rehearsal for Four Quartets. The final stop on our Four Quartets pilgrimage was Little Gidding, a tiny hamlet about 30 miles northwest of Cambridge. In 1626 an Anglican religious community was founded there by Nicholas Ferrar, a friend of the poet George Herbert. It came under attack during the English Civil War, and briefly served as a refuge for King Charles I when he was fleeing Cromwell’s troops. Eliot probably only visited Little Gidding once, in 1936, but it impressed him sufficiently that he named his final Quartet after it. He wrote the poem in 1941 during the Blitz, the sustained German air attacks, when he served as a volunteer fire watcher. The poem is full of references to wartime and death (the “dark dove with the flickering tongue” is actually a German fighter bomber) and it seems likely that Eliot was thinking of the remote village’s role as a place of sanctuary in a historical war when he chose it as the final location for Four Quartets. We made our journey in May, and sure enough the hedges were white with spring blossom. As we drove towards Little Gidding, we marveled at how specific Eliot’s directions were. The hamlet is in the middle of fields and there is really only one way to reach it (“the route you would be likely to take / From the place you would be likely to come from.”) The final stretch of road is a dirt track, and then, sure enough, it turns behind some farm buildings and an old brick pigsty. The Little Gidding pigsty. All photos by Gideon Lester. At this point on our journey we had come to expect two things – that someone would guide us (the Harrowbys at Burnt Norton, the taxi driver at East Coker, the ship’s captain at the Dry Salvages) and that we would find a bell. Sure enough, as we walked into the tiny visitor’s center at Farrar House, the main building at Little Gidding, we were met by a woman who seemed almost to have been expecting us. “Would you like a cup of tea now, or after you visit the chapel?” she asked. 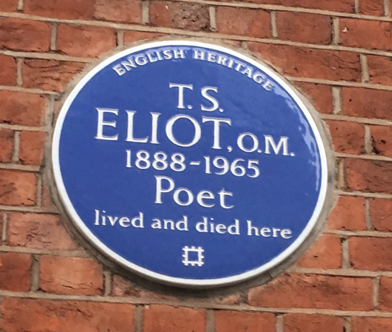 Where prayer has been valid"
Once again we were walking in Eliot’s footsteps; once again we imagined him here in the still, prayerful place, both when he visited in person, and when he journeyed back to Little Gidding in his imagination during the horror of the blitz. Our physical journey was over. 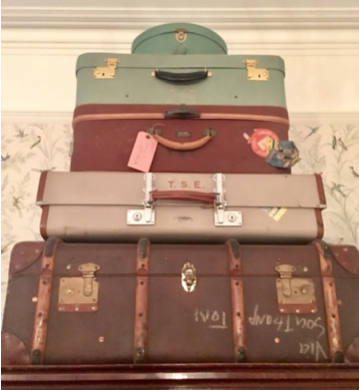 Now a new journey began, as Pam began to imagine how our visit to these four quiet, out-of-the-way places would find new embodiment in the dance that she would soon start creating for Four Quartets. T. S. Eliot pointed out the close relationship between the Four Quartets and the four elements. “Burnt Norton” and its sudden shaft of sunlight is the poem of air; “East Coker” reminds us that life comes from and returns to earth; the dominant symbol of “Little Gidding” is fire. The element of “The Dry Salvages” is unquestionably water, in the form of river and sea. The Eliots’ house in Gloucester is now a writer’s retreat, owned and managed by the T. S. Eliot Foundation, and it was there that Pam and I spent a night before visiting the Dry Salvages. The house is spacious, and welcoming. In Eliot’s day its porch had an uninterrupted view of Gloucester Harbor, though trees have now grown up around it. It was an extraordinary feeling to stay there, in the rooms where TSE slept and lived as a boy, in that landscape that he loved so much. If we believed in ghosts, we would certainly have felt his spirit here. The bell is an essential sound of the sea for Eliot – and by now it had become eerily apparent that bells were also accompanying us throughout our Four Quartets pilgrimage: the bell on the house at Burnt Norton, in the churchyard at East Coker, and now here, on the promontory where Eliot played as a boy. Would there be a bell at Little Gidding too? It took about an hour to journey out to the Salvages. The rocks are low-slung – just a meter or two above sea level, and the cluster is almost entirely covered at high tide, making it hazardous to shipping. Even on this calm day there was a significant swell, and except for a large colony of seals there was little sign of life in this barren, remote place. “In my beginning is my end.” The core of “East Coker” is the cycle of birth and death, and the place that inspired the poem is deeply connected to the beginning and end of Eliot’s own life. This tiny hamlet in Somerset was home to the poet’s ancestors, one of whom, Andrew Eliot, emigrated to the New World in 1669. It is also Eliot’s final resting place; he and his second wife Valerie are buried in the village church, St Michael and All Angels’, which dates from the late 12th century. Indeed the village is built from grey stone, and yes – there were dahlias blooming on the warm summer day. We sat on a bench in the churchyard, imagining the one time that Eliot visited the village while alive, to pay homage to his ancestors. That was in 1937, and 3 years later he published “East Coker.” We were reading the poem aloud. When we were suddenly startled by a long peal of church bells. It was three o’clock. Only in hindsight did we remember that other bell in the garden at Burnt Norton; on that summer’s afternoon the tolling bell in the country churchyard seemed to us a merely an expression of this beautiful place where Eliot once walked, and where he now rests. T. S. Eliot named the Four Quartets after four places that held special significance for him. As Pam Tanowitz began conceiving her performance, we decided to visit the four sites which inspired Eliot to write the poems. We made our journey in May and June 2017, as a kind of pilgrimage in search of a deeper understanding of the Quartets. In the next four entries, I’ll write about some of our experiences. Was he thinking of this very bell that we were now looking at, set into the side of the house? The garden was full of birdsong when we visited, and a strong wind blew through the trees, as you’ll see in the video I posted on this blog a few weeks ago. It was easy to imagine that “the leaves were full of children, / Hidden excitedly, containing laughter” – and also to imagine Eliot standing here, 83 years earlier, in this half-wild garden at the heart of the English countryside. For a moment past, present, and future seemed to coincide, and we understood the opening lines of the poem in a new and vivid way. The set for Four Quartets is based on four paintings by the esteemed abstract artist Brice Marden. Brice and his wife Helen, also a great artist, live in Tivoli NY, close to Bard and the Fisher Center. I recently talked with Brice about the canvases that form the set design, and the following is an excerpt from our conversation. Gideon Lester: When did you first encounter Four Quartets? 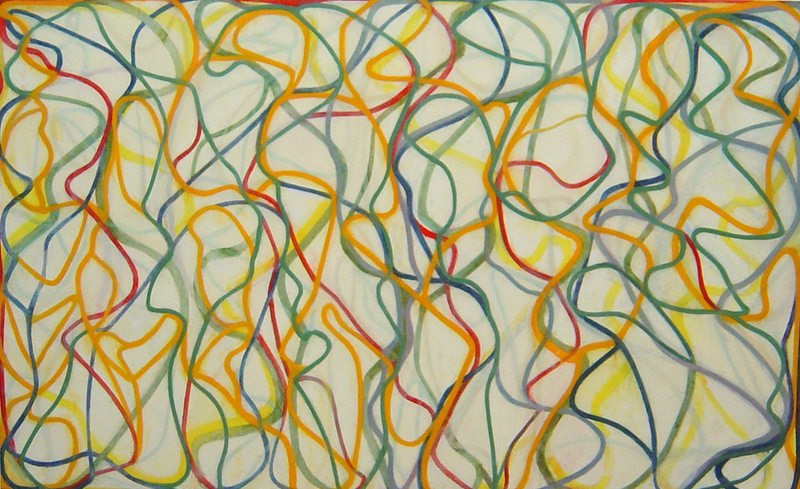 Brice Marden: It was probably in the late 70s. I remember my brother had a book of Eliot’s works, and I was curious about what he was reading. I had a friend who was a restaurateur and dope dealer, who also taught English. We read the Quartets together and he explained them to me, but I wouldn’t say I’ve made a study of them. BM: I’m glad he saw that, though, I wasn’t thinking directly about Eliot when I painted it. GL: In Four Quartets Eliot is seeking to express an experience of the sublime. 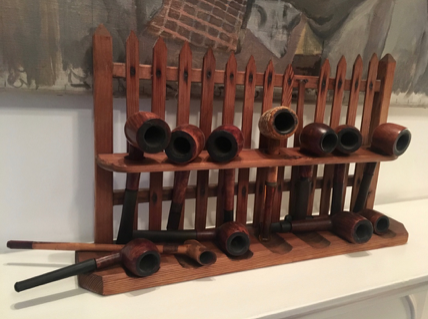 This seems to be a point of deep connection with your own work. BM: I’ve recently been doing all these green paintings, and have been working a lot with the pigment Terre Verte, green earth, and there’s so much reference inherent in these materials that I don’t think I’m putting all that much of myself into it. More and more I find when I paint that I go sort of blank, as if I’m a vehicle. I’m at a point in my life where I’m reconsidering a lot of things, how I’m spending my time. That’s one of the reasons I took on Four Quartets. GL: What interested you in the project? BM: The whole collaboration thing. I really like dance. It seemed like a very good idea, the combination of poetry, dance, contemporary music… though I’m not terribly involved in music right now, or dance. Also I said yes because you made it difficult to say no. It’s Bard, and I’m up here, I’m part of the community. GL: I think you’ve collaborated with choreographers twice before? BM: I did a set for a Karole Armitage production of Orpheus and Eurydice in Italy, and lights and costumes for Baryshnikov, who was performing Cunningham’s Signals. GL: You’ve talked in the past about the way that the physical action of painting has a choreographic quality for you. Your painting The Muses was inspired by dance, wasn’t it? BM: That was more about madness. I had an image of the muses dancing wildly in the Peloponnese. There’s no depiction in my paintings, though there is movement, which could be associated with dance. GL: Have there been periods when you were particularly interested in dance? I imagine you encountered postmodern choreographers when you were working as Robert Rauschenberg’s assistant? BM: I remember that Merce [Cunningham] would come by the studio. Rauschenberg worked mostly at night, so I’d be getting ready to go home and all these people would start trickling into the studio at cocktail time. He was working with Deborah Hay, Steve Paxton. GL: The two dimensional nature of painting, the plane, is of great importance to you. I’m curious how it has been for you to think about set design, which is three dimensional. BM: Yes, the whole idea of flatness, and the tension between flatness and the and the illusion of non-flatness — a lot of that is arrived at by color. But for Four Quartets most of the pieces Pam and Clifton [Taylor, the scenic designer] chose are very architectural, and they can be broken down in an architectural pattern. GL: The design incorporates four of your paintings, one for each of Eliot’s poems. Maybe we could talk about about each of them. The first, for “Burnt Norton”, is a detail from a painting with four sections, called Uphill 4. What’s the significance of the title? BM: Nothing. I have a studio here in Tivoli that’s up the hill. I refer to it as the uphill studio. That’s all. GL: I had an elaborate theory about why the title was perfect for Eliot’s poem. He has a line about “the figure of the ten stairs,” an image from the mystical writer John of the Cross, which imagines love as a staircase. So, uphill! BM: That’s a very rich interpretation and it’s fine by me. That’s what happens when you put things out in the world. GL: At the bottom of the canvas there’s a band where you let the paint drip down from the top. That sense of chance also reminds me of Cunningham and his collaborations with John Cage. BM: When I first starting showing paintings I did that a lot. I was making monochromatic paintings, and the drips at the bottom were an indication that they were handmade. It was at a time when a lot of painters were trying to make it look as though their work was mechanical, not made by hand. Later I stopped, though I’ve returned to it more recently with paintings like this one. GL: How about the “East Coker” painting, Thira? It’s much more controlled. BM: It’s all about opposites. Green and red are complements, and I tried to complicate the reading of it with the orange and blue. I’m always trying to mix colors in a certain way. I used to be if not radical then at least contemporary, and now I feel that I’m much more conservative. I’m still working with these ideas of color. GL: “Thira” means door in ancient Greek. You use the structures of post and lintel doorways in a lot of your work. The form looks like Stonehenge, which isn’t far from the village of East Coker. Eliot writes about old stones, old structures, in that poem, so it’s resonant. BM: I was thinking about the ancient dolmens and stone circles from the Burren in Ireland. Also classical buildings in Greece, with their solid and open spaces. GL: The painting for “The Dry Salvages” is much more recent; I think you finished it this year. Can you tell me about it? BM: It’s based on ideas of rocks from Japanese gardens, but it’s also about numbers. It’s all very unresolved. I’m drawn to idea of the scholar’s rock, the artist keeping a rock in his studio as a microcosm or macrocosm. There are three clusters of rocks in the painting, and there are yellow horizontal lines, which mark off two-thirds of each rocks. That’s basically what the Japanese do — they bury two-thirds of the rock, so it’s coming out of the earth. GL: Or coming out of the ocean, in the case of this poem. The painting fits perfectly. It almost looks like a map of the Dry Salvages, the rocks that Eliot was writing about. For “Little Gidding” we’re using a much earlier image, which you made in 1980. BM: Structurally it’s related to Thira. It contains some ideas from stained glass window studies I did for Basel cathedral. GL: Again the connections are uncanny; Little Gidding is a chapel, and the painting could almost be its windows. Poetry has been an important source for you in the past. In the 1980s you created a series of etchings to accompany a translation of 36 poems by the Chinese poet Tu Fu, and later a group of large canvases, “Cold Mountain,” inspired by the Zen nature poet Hanshan. BM: Yes, I discovered Tu Fu through the translations of Kenneth Rexroth, who himself was a great nature poet. I got very interested in Chinese poetry. I also love Yeats. I love poetry because it’s apparently so simple. The music for our Four Quartets is by the esteemed Finnish composer Kaija Saariaho. We approached her about the project because we knew that she loved Eliot; one of her earliest works, “Study for Life”, was inspired by Eliot’s poem “The Hollow Men”, and on the last page of the score of her cello concerto “Notes on Light” she included a quotation from “The Waste Land.” We were beyond thrilled when she accepted our invitation to create a musical score to complement the poetry of Four Quartets. Kaija’s music combines remarkably well with the poems of Four Quartets – in part, I think, because of the spacious, open structure of her compositions, and because there is already such a deep musicality to Eliot’s writing. Eliot had long experimented with musicality in his poetry (think of that famous approximation of jazz rhythms from The Waste Land – “O O O O that Shakespeherian Rag— / It’s so elegant / So intelligent”) but it was in Four Quartets that his equation of words and music reached fullest expression. Whenever I hear the haunting sonorities of Kaija’s compositions, I am reminded of Eliot’s description of music that “Moves perpetually in its stillness.” It was as if these words and music were made to complement each other. There are very few actual settings of Eliot’s poetry as songs, Andrew Lloyd Webber’s Cats notwithstanding. After Eliot’s death, his widow Valerie, who created the terms of his estate, was clear that her late husband’s major works were not to be sung. Exceptions have been made only twice – for Elliott Carter’s “Three Explorations”, based on stanzas from Four Quartets, and Stravinsky’s gorgeous motet “The Dove Descending,” which sets a lyric from “Little Gidding.” Eliot and Stravinsky were close friends, and Stravinsky composed the anthem in 1962. Before Pam Tanowitz could begin developing a performance based on Four Quartets, we needed to obtain permission from T. S. Eliot’s estate. In 2016 I approached Clare Reihill, who runs the estate, and pitched the idea to her. Clare invited me to meet her at the estate’s offices, which are housed at the London flat where Eliot lived with his wife Valerie from 1957 until his death in 1965. Clare, a publisher, was Valerie’s assistant in the final years of her life and oversees the management of the Eliots’ legacy. Clare welcomed me and gave me a tour. The rooms are small and unexceptional, but I found it intensely moving to be there, for the first time sensing the Eliots as real people living their lives in ordinary rooms. Eliot was for many years a publisher at Faber & Faber, and part of his library remains in the flat, including a copy of Ulysses that James Joyce gave him. Much to my relief, Clare responded positively. The estate granted us a license and has supported the development of the performance in countless ways, for which my colleagues and I owe Clare enormous thanks. Sitting in that flat in Kensington, where Eliot is and is not, where his life ended and the journey of our performance began, I understood these lines as if for the first time. As Pam Tanowitz and I continued our research on Four Quartets, Clare made it possible for us to visit several other places of significance for Eliot, including his childhood summer home in Gloucester, MA, and the church in East Coker where he and Valerie are buried. Those were also extraordinary experiences which shaped our understanding of the poems. I’ll write about them in the coming weeks. I’ve recently spent time in rehearsals with Pam Tanowitz as she creates the choreography for Four Quartets, and have been struck by how much the vital flame that Eliot described is present in her dances. I find her performances deeply moving, in part because they exemplify the “combination of remoteness and intimacy” that is also in Eliot’s poetry. The idea to create a dance based on Four Quartets came from the poems themselves, which are rich in images of dancers and dancing. As the choreographer Pam Tanowitz and I began our research, we learned that T. S. Eliot loved dance, especially ballet. Eliot followed the leading choreographers and dancers of his day, including Léonide Massine, Mikhail Fokine, Antony Tudor, and Vaslav Nijinsky, and may even have seen Isadora Duncan perform in Paris or London. He often attended performances by Serge Diaghilev’s Ballet Russes – in Four Quartets he makes reference to Fokine’s famous ballet Le Spectre de la Rose, created for Nijinsky. This is the first in a series of blog posts I’ll be writing about the evolution of Four Quartets, the major dance commission that will premiere in the Bard SummerScape Festival in July. 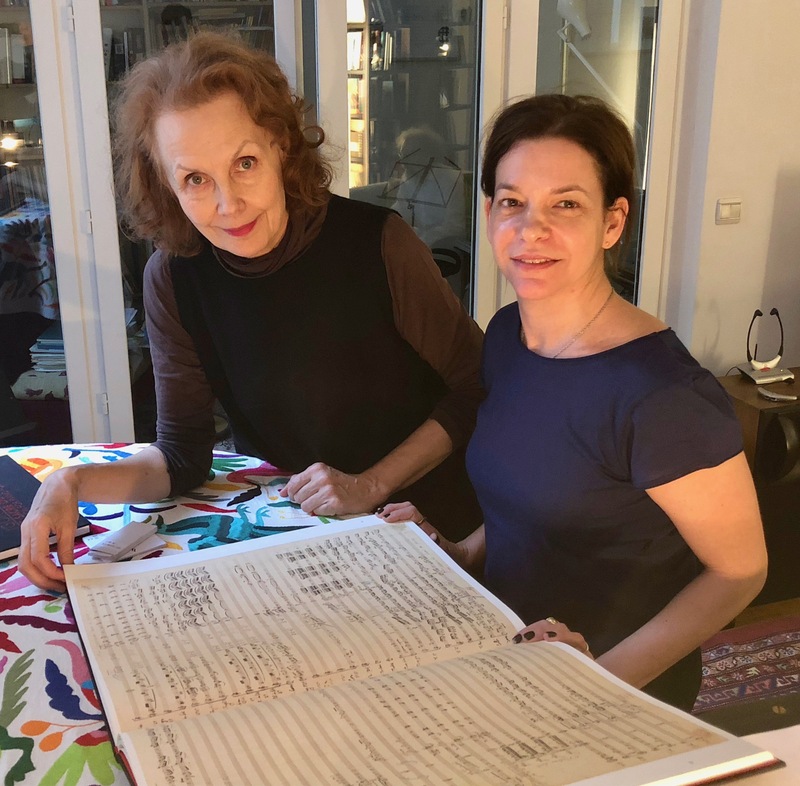 The project is being created by a group of superb contemporary artists – choreographer Pam Tanowitz and her dance company, the composer Kaija Saariaho, visual artist Brice Marden, actress Kathleen Chalfant, and The Knights, a Brooklyn-based contemporary music ensemble. Together they are developing an ambitious performance that celebrates T. S. Eliot’s last great poetic work, Four Quartets, first published at the height of World War II in 1943. Eliot’s poems are complex and beautiful meditations on time and timelessness, and on the limits of human comprehension of the divine. 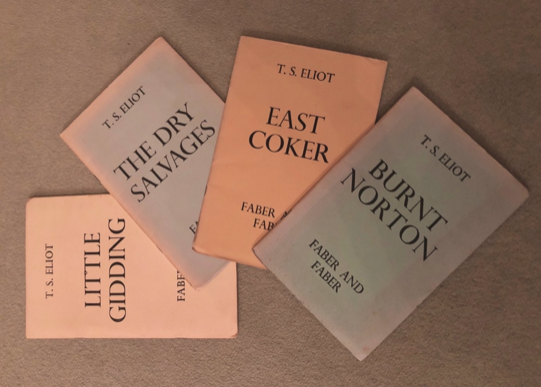 Eliot wrote them in part as a response to spiritual epiphanies he experienced in four particular places, which also give the poems their names – Burnt Norton, East Coker, the Dry Salvages, and Little Gidding. Three are in Britain, and one, the Dry Salvages, is a cluster of rocks off the coast of Massachusetts. There is a complete text of the poems here, and you can also find recordings online of several great actors reading the poem, including Jeremy Irons, Alec Guinness, and even Eliot himself. We immediately discovered our mutual love of Four Quartets. Each of us had been particularly struck by the frequency with which dance and dancing recur in the poems (which I’ll write about in a future post.) I asked Pam to consider creating a dance performance with Eliot’s poems as the score, timed to coincide with the 75th anniversary of the publication in 2018, if we could obtain the rights. Three years later we indeed have the rights – Pam’s Four Quartets will actually be the first authorized dance or theater performance inspired by the poems – and the creative process is well underway. I look forward to sharing details with you in the coming months. T.S. Eliot loved dance, and witnessed first hand many of the innovations that shaped its history in the first half of the twentieth century. In 1910, when he was 22 years old, Eliot spent a year in Paris. While he was there he encountered the legendary American dancer Isadora Duncan, who was the talk of the town. Duncan was a modern dance revolutionary and pioneering feminist, a combination that had made her both famous and infamous around the world by the time she had arrived in Paris. Her unique style aimed to strip the dance from external hindrances, such as toe shoes and tutus, and bring it back to the unconstrained body. It is easy to imagine this reconfigured temporality, neither movement from nor towards, encapsulated in Nijinsky’s leap, suspended in mid-air, evaporating into a dawn that is both in time and beyond time. Isadora Duncan and the Ballet Russes transformed the relationship between music, visual arts, dance, and poetry, drawing upon new experiments in literature and in turn influencing the way dance was captured in text. TS Eliot’s Four Quartets both records this new relationship between the arts and is a major intervention in this reconfiguration. The Four Quartets have physical presence in the world. In the poems words fall, rise and shift places with each other in a textual dance. T. S Eliot’s Four Quartets trouble the boundary between the still and the moving, text and the dancing body. Pam Tanowitz’s Four Quartets is a major intervention in the relationship between the sister arts which continues this lineage. Dana Mills is a dance and political theorist. Her first book, Dance and Politics: Moving Beyond Boundaries, is published by Manchester University Press. Isadora Duncan, My Life, 1996, London: Gollancz. Lyndall Gordon, The imperfect life of TS Eliot (2012), London: Virago. Nancy Hargrove, T. S Eliot’s Parisian Year (2009) Gainesville: University of Florida Press. Jennifer Homans, Apollo’s Angels: a history of ballet (2010) London: Granta. Susan Jones, Literature, Modernism and Dance (2013), Oxford: Oxford University Press. Four Quartets is co-commissioned by the Fisher Center, the Center for the Art of Performance at UCLA, Barbican, London, and Lincoln Center for the Performing Arts. Four Quartets, T. S. Eliot’s mysterious and beautiful masterpiece, is a meditation on time and timelessness and is now prized as one of the 20th century’s most stunning literary achievements. Seventy-five years after its publication, Eliot’s poetry cycle has inspired three astonishing contemporary artists to join forces in a ravishing union of dance, music, painting, and poetry. 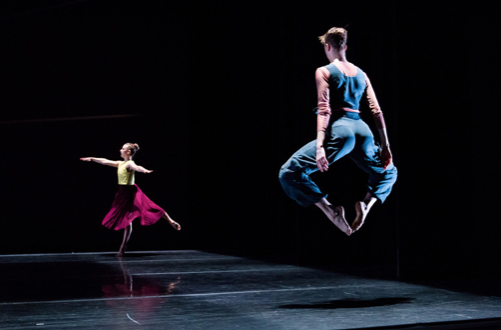 American choreographer Pam Tanowitz, legendary composer Kaija Saariaho, and American modernist painter Brice Marden are creating a vast and thrilling performance from Eliot’s meditations on past and present, time and space, movement and stillness. Joining them is Tony Award–nominated actress Kathleen Chalfant (Angels in America, Wit) performing Eliot’s text live. This unprecedented collaboration, the first authorized performance based on Four Quartets, promises to be one of the must-see events of the year.